Microfinance Industry Report Card: good performance of Cambodian MFIs driven by portfolio growth. In the period January 2011 – April 2012, MFR rated 6 Cambodian MFIs, accounting for 50% of the total outstanding portfolio and 60% of total borrowers as of December 2011 (CMA Network Information Exchange). 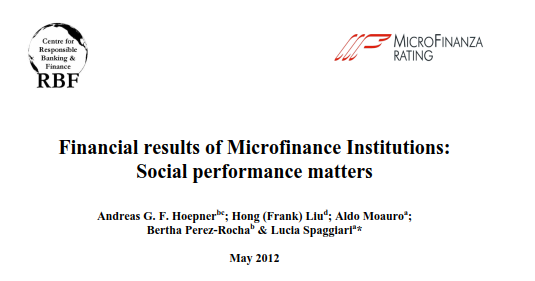 The purpose of this study is to contribute to the research on the relationships between financial and social performance of microfinance institutions. The Centre for Responsible Banking & Finance at the University of St. Andrews (UK) applies advanced statistical techniques to the in depth performance data from MFR. The hypotesis that the relationship is parabolic instead of linear is broadly confirmed by the empirical results. Social performance (SP) management and social responsibility towards the staff are needed to sustain financial performance but lose their positive financial impact after a certain point (inverted U-shape). In contrast, building client protection systems from scratch can be costly, but the efforts pay off once the “minimum critical mass” of client protection is achieved to ensure the clients’ and investors‘ trust (U shape). The findings imply that SP matters for the financial results; understanding the synergies and the trade-offs between the two is key to balance the sustainability and the progress towards the social mission. Recent studies in the microfinance arena identify missions drifts of MFIs away from their socially responsible ambition and highlight that their boards of directors might lack motivation to commit to this key promise (Copestake, 2007). These tendencies to digress from the stated social mission, coupled with irresponsible institutional behavior, besides representing a governance failure, pose a systemic threat to the microfinance sector as a whole. In this context, this workshop paper written for the Microcredit Summit Campaign explores some topics that have the potential to motivate the MFIs’ BoD to promote and deepen the social mission of their organizations. Investigating the relation between social and financial performance is key in a sector aiming at contributing to social development in a financially sustainable way. MFR is willing to contribute to the discussion by sharing some of the findings arising from the social ratings conducted so far, bringing in particular the added value of accurate data collected through client surveys. The social performance indicators are taken from MFR’s methodology. With reference to financial performance, the main indicator is the Operational Self Sufficiency (OSS) ratio, mainly collected through financial ratings. MFR’s social rating methodology allows a direct measurement of poverty and financial exclusion. Encouraging financial self-sufficiency and professional management of MFIs should not by any means discourage the original outreach objective of the microfinance mission, which is to cater financial services to those segments of the population living in poverty conditions. MFR is willing to share its experience cumulated through social ratings in order to try to provide some concrete answers on the issue of depth of microﬁnance outreach. The analysis beneﬁts from the added value of the comprehensive social rating methodology, which allows a direct measurement of poverty and financial exclusion thanks to surveys conducted on clients. Results are referred to a sample of recent clients of MFR. Social Responsibility and consumer protection have become critical issues in microfinance and there is evidence of a continuing effort within the sector to apply corporate social responsibility standards (staff, clients, community and environment) to microfinance as well. Moreover, the need to put clients first and to protect them from possible negative effects of the services provided is even more important for the microfinance industry whose declared target is to reach out to poor and vulnerable people. The Smart Campaign was launched as a global effort to unite microfinance leaders around a common goal: to keep clients as the driving force of the industry and to widespread the implementation of the consumer protection principles.